STAMFORD, Lincolnshire, England -- This sceptered realm boasts dozens of so-called Great Houses, the castles, palaces and sprawling estates established by history's wealthy and powerful and sustained and enhanced over the centuries by their heirs. During a weekend visit to England, I got a chance to peek into three Great Houses in the East Midlands in the center of the country about 100 miles north of London. Here are quick sketches. A gravel drive leads the eye past lawns and topiary toward the south entrance of Burghley House, the largest and grandest estate of the first Elizabethan Age. The original mansion was built between 1555 and 1587 by William Cecil, Lord Treasurer to Queen Elizabeth I. Its formal gardens and deer park were laid out by Lancelot "Capability" Brown in 1775-80. Even among England's array of sumptuous residences, Burghley House stands out, widely regarded as the grandest house of the first Elizabethan age. For four decades William Cecil faithfully served Queen Elizabeth I, first as her most trusted adviser. When she ascended to the throne in 1558, he became her principal secretary, and later lord treasurer of Britain, a position he held until his death in 1598. So it's understandable that he'd want a residence befitting his august station. So in 1555, Cecil undertook the design and construction of a large Tudor mansion at Burghley, the 450-acre estate he inherited from his father outside the market town of Stamford. The building project continued for 32 years. In addition to his other accomplishments, Cecil founded an aristocratic line of lords, earls and marquesses, that continues to this day. Although none of the first Lord Burghley's successors attained his lofty political stature, many served the country, and two of them made dramatic changes to the house, transforming it beyond recognition. John, the fifth Earl, and his wife, Lady Anne Cavendish of Chatsworth, shared a passion for art. Among England's earliest "Grand Tourists," they traveled extensively through Europe between 1660 and 1680, collecting hundreds of paintings by Italian masters, along with tapestries, sculptures, ceramics and other art. They brought their treasures back to Burghley, which they had remodeled on a royal scale. New facades were created and the house was expanded to include 35 major rooms and more than 80 lesser rooms built around a central courtyard. 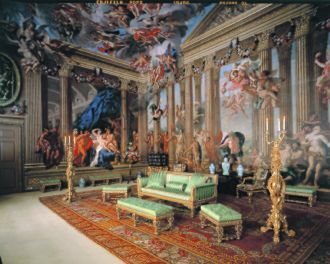 The fifth Earl also brought in the Italian muralist Antonio Verrio, who spent nine years covering the ceilings and walls of half a dozen rooms with fantastic trompe d'oeil scenes, including the so-called "Heaven Room" and "Hell Staircase." The trompe l'oeil murals of cavorting gods and goddesses on the walls and ceiling of the "Heaven Room" in Burghley House were painted in the 1680s by Antonio Verrio. However, their passion for collecting left the estate impoverished, and it was nearly a century before their great-grandson, the ninth Earl, completed the vision, bringing in the noted designer Lancelot "Capability" Brown. Given a free hand to work, Brown totally recast the house and grounds, which by then had been expanded to more than 1,400 acres. Subsequent descendants continued to add to the estate and its honor, including hosting several visits by Queen Victoria and Prince Albert. But a more recent Lord of the Manor, David Cecil, the sixth Marquess of Exeter, brought honor to Burghley in another way, winning an Olympic gold medal for the 400-meter hurdles in 1928 and a silver medal in 1932, a story portrayed in the Oscar-winning 1981 film "Chariots of Fire." His Olympic medals and other memorabilia are among the thousands of family artifacts on display around the house and grounds. The Great Hall at Burghley House was used for banqueting in Elizabethan times and also during a visit by Queen Victoria in 1844. When Lord Cecil died in 1981, Burghley House and most of its contents were turned over to a charitable trust to manage. Though the house along with its sprawling sculpture garden and deer park are now open to tours and recreation, the estate continues as a home of the Cecil family. One measure of Burghley's magnificence is the attention it attracts as a backdrop for movies, such as "Pride and Prejudice" (2005), the "Da Vinci Code" (2006), and "Elizabeth: The Golden Age" (2007). Open April through October, from 11 a.m. to 5 p.m., Burghley House features a new "Garden of Surprises" with 15 fanciful water features, "tricks and conceits" designed to delight children. 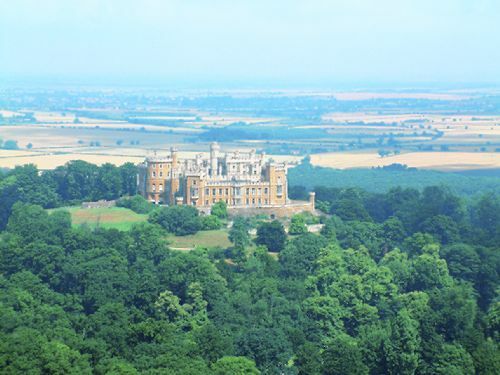 Belvoir Castle, situated seven miles west of the town of Grantham, this turreted Gothic edifice perched on a hilltop overlooking the 30,000-acre estate that has been the ancestral home of the Dukes and Duchesses of Rutland for nearly 1,000 years. Though its name derives from French for "beautiful view," it's actually pronounced "beaver." There has been a castle on this high point since 1070, but it has been destroyed and rebuilt four times. The first castle, a Norman keep built by Robert de Todini, was demolished in 1464, during the War of the Roses. The second castle was erected during the reign of Henry VIII by the Manners family. This fortress stood for 120 years until it was blown up in 1649 during the English Civil War. 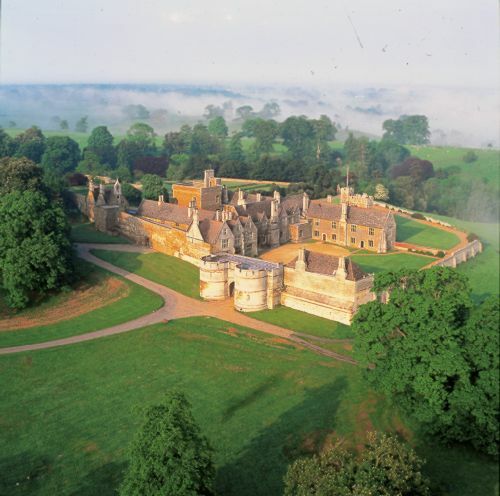 After the monarchy was re-established, the Earl of Rutland built a fine mansion in the classical style, an enormous house with four wings built around a central rectangular courtyard. In 1799, the Fifth Duke of Rutland then 21, married 20-year old Elizabeth Howard, who wanted to have a more traditional castle with towers, turrets and battlements. 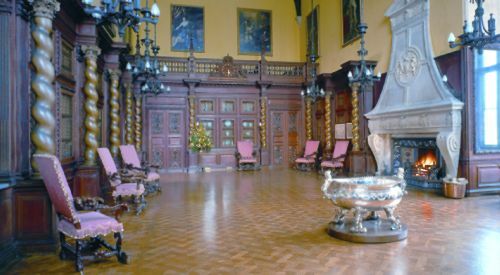 So over the next 30 years the castle was rebuilt in the Gothic Revival Castle that stands today, with some 250 rooms complete with a great deal of fine Regency furniture, and a fabulous collection of fine art. Elizabeth, a lover of art and culture, entertained many illustrious guests, including her friend, Jane Austen, who was a regular visitor. Still privately owned, Belvoir is now home to the Eleventh Duke of Rutland, his wife and their five children. To share their estate, as well as generate revenue to sustain it, they have opened half of the castle to the public for tours hosted by costumed docents from May through October, and also at Christmas time. Belvoir boasts stunning interiors, with rich furnishings, magnificent artifacts and an extensive collection of art, including works by Thomas Gainsborough, Joshua Reynolds, Nicolas Poussin and a famous portrait of Henry VIII by Hans Holbein. The castle's chapel contains the crypt of its Norman founder. Outside, sloping lawns lead down from the castle to the Rose and Statue Gardens, elegantly laid out around a central fountain. A large lake, also laid out by Lancelot "Capability" Brown, offers excellent fishing, and the estate still regularly hosts shooting events and riding hunts, though these days, without the foxes. Belvoir has also played roles in several movies, appearing in "The Da Vinci Code" as the Pope's summer palace, Castle Gondolfo. Also shot there were various scenes for "The Young Victoria," a film directed by Martin Scorsese scheduled for release this summer. Situated on an escarpment overlooking the Welland River valley just north of the town of Corby, the Great Hall of the present Rockingham castle was built in 1086 at the direction of William the Conqueror on the site of an even older Saxon fort. The Norman keep that grew around it quickly became a seat of government, hosting the Great Council of Rockingham in 1095. King Richard I, also known as Lionheart, frequently hunted here and his unpopular brother John, the villain in tales of Robin Hood, also used the castle. One legend suggests John buried his crown jewels at Rockingham. As the castle's strategic value diminished, King Henry VIII deeded the estate to Edward Watson, ancestor of the current owners. A portrait of Henry hangs in the Great Hall alongside Jane Seymour, Henry VIII's third wife, who died of post-natal complications following the birth of Edward VI. There's also a portrait of his daughter, Queen Elizabeth I, surrounded by several courtiers, including William Cecil of Burghley fame. During the English Civil War, Rockingham was a Royalist stronghold. It was taken by Cromwell's Roundheads and then besieged by the King's troops. Although the castle survived repeated assaults, the turmoil cost its owner much of his wealth. It wasn't until Victorian times that the Watsons of Rockingham regained their stature. Among the friends of Richard and Lavinia Watson was Charles Dickens, who frequently visited in the 1850s, writing there, reading from his works and performing his plays for small gatherings. In fact, Dickens used Rockingham as inspiration for Chesney Wold, the estate in his novel "Bleak House." The castle's ramparts enclose 12 acres of sweeping lawns, with formal and informal gardens set among the medieval fortifications. There is a circular rose garden, the 400-year-old Elephant Hedge topiary, and a magnificent wild garden below the ramparts with more than 200 species of plants. Still privately owned by the Saunders Watson family, the castle is open for tours from April through November on Tuesdays, Sundays and Bank Holiday Mondays from noon to 5 p.m. It also hosts special events, including re-enactments of historical events that happened there, as well as medieval jousting tournaments.